We engineer tires and wheels to improve traction, strength, and style. That performance benchmark will propel System 3 Off-Road ahead of its competition. System 3 Off-Road tires and wheels are distributed exclusively by Tucker Powersports. The Tucker dealer network is ready to serve. Ask your favorite retailer about Tucker and System 3 Off-Road. 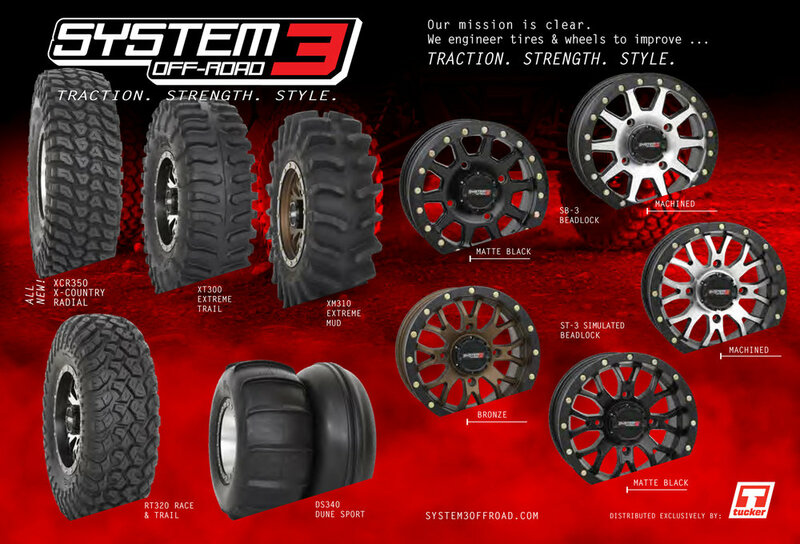 System 3 Off-Road engineers and designers ride off-road and understand the products. The team behind these tires and wheels includes industry professionals with years of experience in the off-road tire and wheel business. When engineering the brand's new tires and wheels, company leaders created a system to prioritize the three fundamentals - traction, strength, style - desired by every off-road enthusiast. With exclusive distribution by Tucker Powersports, System 3 Off-Road will provide the marketplace with high-powered products and top-notch service. It's easy to think this is simply about tread patterns. But traction is much more than that. A tire's sidewall design, the rubber compound and its durability, the tire width and its application on a wheel. Plus the wheel itself and its strength and weight. All that impacts traction - and impacts our work every day. Tires need a balanced strength that delivers the right carcass durability with a weight that is performance-focused. The structural strength of a wheel and its ability to shoulder a load means a wheel's strength is about more than just durability. We engineer for strength in tires and wheels. Form and function are part of our work day to day. We know that's important to you as well, even if the tire and wheel is submerged in a mud hole.